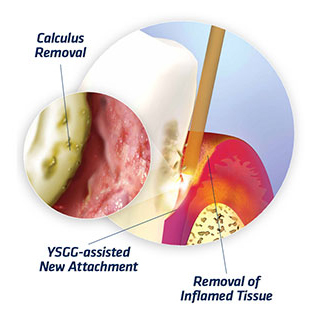 Laser Assisted Periodontal Therapy, or LAPT for short, is the latest advancement in Periodontal Infection Removal. The laser uses a specific wavelength that targets and destroys diseased tissue and bacteria from periodontal pockets. In Laser Assisted Periodontal Therapy (LAPT) there is no cutting away of the gums or bone as in traditional treatment. This specialized laser uses a unique combination of laser energy and water to provide gentler, more precise treatment that conserves healthy tissue and minimizes pain and discomfort. There are so many reasons why it is beneficial, one can see why dentists use it throughout the United States. The following are some of these benefits. In addition to the laser’s increased accuracy and shortened treatment time, patients, one for one, prefer the laser over traditional treatment because it eliminates or minimizes any discomfort (pain) during and after therapy. The #1 reason why patients delay needed trips to the dentist is not wanting to experience the pain related to traditional dentistry. LAPT therapy is minimally invasive and relatively painless, therefore there is often no need for dental shots or anxiety. Laser treatment is about as non-invasive as you can get. There is no cutting of the gum or bone as in traditional surgery. Utilizing LAPT, a small laser fiber is inserted into the diseased gum pocket. This precise laser disintegrates the bacteria and diseased tissue without harming any of your healthy tissues. The disease is removed and healthy gums and bone are given a good chance to regenerate. Lasers are completely safe and have been approved by the US FDA as safe for periodontal treatment, periodontal cosmetics, and implant preparation as well as a variety of other dental procedures. Because our advanced periodontal laser sterilizes and seals your periodontal pockets it hinders re-infection and promoting faster healing. During the procedure the patient will also wear tinted safety glasses. LAPT eliminates disease without harming surrounding healthy tissues. This is why the laser's minimally invasive treatment has been called "Biological Dentistry". LAPT results in healthier gums, leaving more tooth structure and bone intact. In addition, the laser sterilizes as it removes diseased tissue and provides a sealing clot that inhibits reinfection. The #1 reason why patients delay needed trips to the dentist is not wanting to experience the pain, sensitivity and dental shots related to traditional dentistry. LAPT therapy is minimally invasive and relatively painless, therefore there is little or no need for dental shots or anxiety. The laser provides pinpoint accuracy and complete cleaning of diseased tissue without damaging the surrounding healthy tissue. This promotes healing and allows you to keep your natural teeth. Laser therapy replaces the need for dental drills in periodontal treatment by doing the same work gently without the heat, vibration and pressure of dental drilling. It is the heat, vibration and pressure that cause pain. The laser is more accurate and quicker without the annoying whine of the drill. All of this makes for a much more comfortable experience. LAPT is safe for patients with health concerns. In addition, patients taking blood thinning medications (e.g. Coumadin, aspirin, Plavix) need not go off of these medications to receive treatment. It is also more indicated for smokers as gum recession is less prevalent in laser dentistry. The minimally invasive LAPT treatment assures that you get consistently good results. It eliminates your periodontal bacteria and promotes re-growth of the surrounding tissues, giving you a health natural smile that can last a lifetime. LAPT does not result in the loss of healthy gum or bone tissue as almost always occurs in traditional surgery. Loss of healthy tissue can expose your tooth roots leading to more sensitive teeth and a greater chance of tooth decay. One of the unfortunate aspects of traditional periodontal surgery is that the gums need to be cut away to expose the bottom of periodontal pockets where periodontal bacterial grow. This procedure can lead to gum recession and exposed roots which can make your teeth look unsightly. Periodontal therapy with the laser enhances the appearance of the gums by preserving healthy gum tissue and reducing periodontal pockets without gum recession.